Sushma Swaraj also called for terrorists' funding, their weapons supply, training and political support to be systematically cut off. In a veiled attack on Pakistan, External Affairs Minister Sushma Swaraj today said terrorists continue to find shelter in countries using terrorism as an "instrument of state policy" and called on her counterparts from BRICS to condemn efforts to sponsor the menace. Her statement comes ahead of Pakistan Prime Minister Shahid Khaqan Abbasi's address at the UN General Assembly today. "The horror of terrorism continues to haunt global peace and security. Terror groups draw sustenance from support systems in South Asia," Ms Swaraj said at the BRICS Ministerial Meeting on the sidelines of the UN General Assembly in New York. "Terrorists continue to find support and shelter in countries which use terrorism as an instrument of state policy," the minister said. Ms Swaraj also called for terrorists' funding, their weapons supply, training and political support to be systematically cut off. She also called for early conclusion of the CCIT while urging all the BRICS countries - Brazil, Russia, India, China and South Africa - to condemn efforts, including by states, to use religion to justify, sustain and sponsor terrorism against other countries. In her speech, Ms Swaraj suggested an alliance between International Solar Alliance and New Development Bank. 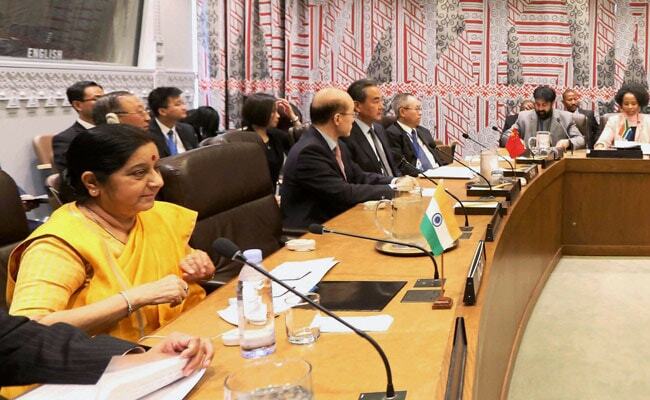 "I hope we can work together to give this ambitious agenda practical shape in coming months," Ms Swaraj added.